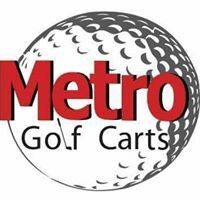 Metro Golf Carts is located in Bismarck ND at 1921 E. Bismarck Expressway. We stock an inventory of over 80 stock and customized carts, Metro Golf Carts carries New, Reconditioned, and Trade-in carts. Choose from EZ-GO, Yamaha, and Club Car in both Electric or Gas powered carts. No other golf cart dealership stands behind their carts like Metro Golf Carts does. We are confident in the carts that we sell you that you will have trouble-free fun with a Metro Certified Reconditioned Golf Cart. Whether your looking for a stock cart or a highly customized, personalized or modified cart, Metro Golf Carts has what you need! Why settle for a limited selection found at other dealers, with poor service and limited experience-- let Metro Golf Carts prove to you, why people say WE really are the best. Metro Golf Carts is a full service one stop golf cart dealership.